Hay fever is an allergy, a disorder of the immune system in which it decides harmless substances such as pollen are dangerous. White blood cells are activated and histamine released resulting in inflammation and leading to skin rashes, excess mucous, steaming and itching eyes and nose. Vitamin C promotes a healthy immune system and helps to reduce an allergic reaction. It is also anti-inflammatory and acts as a natural anti-histamine so it can help to reduce the symptoms of hay fever. You can take 1,000mg (1 gram) of vitamin C twice a day but if symptoms are severe you can increase this to 1 gram four times a day. It is important to choose a good quality supplement that is well absorbed. I suggest visiting your local independent health food shop. Vitamin C foods contain bioflavonoids which help to absorb vitamin C. These include peppers, strawberries, kiwi fruit, broccoli, blueberries, parsley and kale. Quercetin regulates histamine production and promotes a healthy inflammatory response. It can be found in red onions, apples and berries. Supplements can offer around 500mg and this can be taken up to 3 times a day while symptoms are severe. Vitamin E can also help to reduce inflammation and is found in wheatgerm, fish, nuts, eggs, linseeds, avocado and pumpkin seeds. Local honey (produced by bees in your area). The allergy may be to specific pollen from plants growing in a particular area. If the honey contains minute quantities of that pollen eating the honey little and often may help to desensitise the body. Dairy is mucous forming so is best avoided; alternatives include rice, oat, soy and nut milks. Wheat allergy and intolerance are common. The gluten in wheat can be mistaken for an allergen by a hyper-sensitive immune system. The symptoms of wheat allergy are similar to those of hayfever. 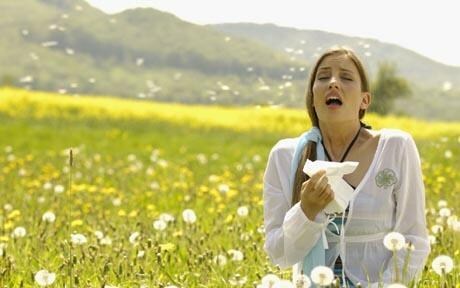 People with hayfever often react to the gluten in wheat. Try replacing it with rye, oats, barley, quinoa, millet and buckwheat (actually from the rhubarb family). Refined and processed foods, colourings and additives place an added strain on the liver as it has to filter the extra toxins from the body. Alcohol, black tea and coffee deplete the absorption of minerals and also strain the liver. If you are drinking alcohol make sure you are including water. Alternatives to tea and coffee include green tea, rooibos, herbal teas such as nettle, chamomile and dandelion coffee.